I lead the Roehampton University Behaviour and Energetics Lab (RUBEL). My body of publications in the main covers four topics, all of which primarily concern vertebrate environmental physiology and energetics: the respiratory physiology, energetics and behaviour of ducks and cormorants; the relationships between the behaviour, ecology and energetics of wild diving king penguins; comparative analysis of diving and pedestrian locomotion across species, and the development of the 'accelerometry technique' as a method for quantifying behaviour and energy expenditure in terrestrial and aquatic animals. A full list of my publications is available here - GoogleScholar and ResearcherID - access to the majority of them as pdfs can be found here - ResearchGate. My present research quantifies the energetic costs for animals in situations where energy expenditure can be high or highly variable. This line of enquiry is motivated by the theory that greater energy costs for an animal can have detrimental consequences for its reproductive success. I am therefore interested both in how animals are adapted to reduce energy costs to tenable levels, and the effects on reproductive fitness of fluctuations in an animal's energy costs. For example, I have studied the energy costs of arboreal locomotion in great apes and how they utilise the inherent elasticity in their environment to their energetic advantage. I also study how perturbations to the environment affect the foraging energy efficiency of seabirds from the UK to the tropics to the sub Antarctic, and in turn how this affects chick rearing during the breeding season. - Studying the behaviour, movements, macro-physiology and thus developing conservation management plans for seabird species inhabiting the Caribbean including the British Virgin Islands (funded by DEFRA Darwin Plus and the Leverhulme Trust) caribbeanseabirds.org.uk. - Assessing the validity of using heart rate loggers and acceleration loggers to measure the costs of wing adornments in volant birds (Royal Society funded). - On going development of a seabird field site on Puffin Island in Wales, primarily to study intra-specific variation in species exhibiting reproductive skew (Research at Puffin Island; internally funded - Roehampton and Liverpool). Yvonne McMeel, (2010-2011) industry funded. Differences between breakfast eaters and breakfast skippers as a result of morningness and eveningness preferences and sleep habits. Dr Tina Smith, (2012-2013) industry funded. Uncovering the mechanisms explaining differences in body mass index between breakfast eaters and breakfast skippers. Dr Sam Coward, (2011-2012) NERC funded. Energy costs and savings of arboreal locomotion in great apes: measuring a tractable model species - humans. Dr Louise Soanes, (2015-2018) Leverhulme Trust Early Career Research Fellow and DEFRA Darwin Plus research associate. Dr Nicholas Payne, (2016-2018) Cascade Fellow. Barriers in the sea: how temperature affects the physiology of oceanic megafauna and defines their global distribution limits. Astrid Willener, (PhD student, 2008-2014), funded by the University of Roehampton and CNRS, France. The biomechanics and energetics of a common behaviour for poorly-adapted species: a thorough analysis of pedestrian locomotion in penguins. (Field work undertaken on the Crozet Archipelago). Co-supervisors: Dr Yves Handrich, CNRS Strasbourg; Dr Siobhan Strike, University of Roehampton. Aspects of the behavioural and physiological ecology of the cuttlefish Sepia officinalis with relation to present and future oceans. Primary supervisor: Dr Jon Houghton, Queen's University Belfast; Co-supervisor: Dr Hansjoerg Kunc, Queen's University Belfast. Philip Collins, (PhD student, 2013-2016), funded by the University of Roehampton. Do phenotypic traits explain reproductive skew in seabirds? (Field work undertaken on Puffin Island). 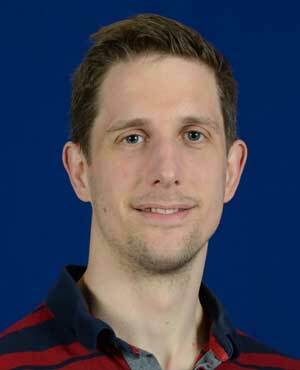 Co-supervisor: Dr Jon Green, University of Liverpool. Christle Coxon, (PhD student, 2013- ), funded by the University of Roehampton. Overeating: The role of food composition, eating psychology and exercise on food intake. Primary supervisor: Dr Leigh Gibson, University of Roehampton. Tessa van Walsum, (PhD student, 2014- ), self-funded. How can king penguins dive so deeply? A study of their cardio- and thermo-physiology. Co-supervisors: Dr Enrico Rezende, University of Roehampton; Dr Yves Handrich, CNRS Strasbourg. Christina Mulvenna, (PhD student, 2014- ), funded by the Northern Ireland Department of Agriculture and Rural Development (DARD). Enhancing farm management by improving both commercial production and animal welfare: development and application of remote sensing technologies. Primary supervisor: Dr Michael Scantlebury, Queen's University Belfast; Co-supervisor: Dr Nikki Marks, Queen's University Belfast. Kelly Edwards (PhD student, 2017- ), funded by the University of Roehampton. Working title: The ecology and energetics of tropical seabirds. Co-supervisor: Dr Andrea Perna, University of Roehampton. Mary Henderson, (PhD student, 2018- ), funded by the University of Roehampton. Working title: Macro-nutrient regulatory influences on physical activity. Co-supervisor: Dr Leigh Gibson, University of Roehampton. Yohann Chemtob (PhD student, 2019- ), funded by the University of Roehampton. Working title: ************. Co-supervisor: Dr Andrea Perna, University of Roehampton. I am a member of the Society for Experimental Biology and a co-opted member of the society's Animal Section. I am on the editorial board of the Royal Society journal Biology Letters. I presently teach on the UG modules 'Biometrics: Physiology, Statistics and Maths', 'Core skills in Biological Sciences' and 'Biosciences Research Methods'. I also convene the first two modules, and oversee the suite of core skills modules in the Department. I supervise a number of second year project proposals, third year independent studies, and third year projects, which often review and research issues of energy expenditure in humans, diving behaviour in animals and various non-invasive physiological topics.